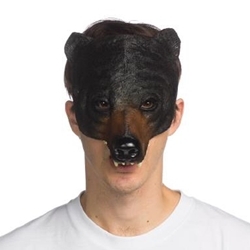 The Bear Half Mask is a one size fits most form fitting mask with elastic tie. The mask has teeth protruding from the bottom. This is a versatile mask in that it takes on the personality of its wearer. When combined with Fake Rubber Fish or Juggling Bean Ball, you can dress as a comedic or circus bear. When paired with Stage Blood, you can become a vicious bear. The amount of choices this mask allows is unBEARable!